Her Order of Australia Medal (OAM) was announced on Saturday with the official release of the 2019 Australia Day Honours List. Dr Grimes has written many books about the history of the South Burnett, including “Pioneering Into The Future: A History of Nanango Shire”, and works about Wooroolin and Memerambi State schools. 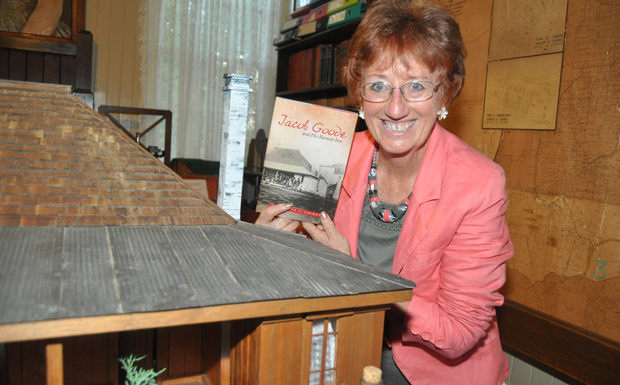 In 2013, she released “Jacob Goode and His Burnett Inn”, the story of the founding father of Nanango who built the Burnett Inn beside a waterhole in 1848. The township of Nanango grew around this first commercial building. And in 2015, Dr Grimes published “Squatters in the South Burnett: Their Life and Times 1840-1860”. This book tells the story of the first European settlers in the Nanango area, John James Malcolm Borthwick (Tarong Station) and William Elliot Oliver (Nanango Station), who came to the area in the mid-1840s. She is currently writing a history of the Burrandowan races. Dr Grimes is also well-known for her work assisting local residents researching their family histories, holding regular workshops at local libraries. The OAM also recognises Dr Grimes’ service to education, especially her work assisting students complete their Duke of Edinburgh awards. Congratulations Judy! Well deserved! Her “Pioneering into the Future – History of Nanango Shire” was a massive job and so valuable, as are her other books! Judy is so helpfull with family history also. Great news! !